Eccentric syringes associated with Chiari I malformation have received scant attention in the medical literature. Herein, we describe our experience and long-term outcome in patients with this finding. A retrospective analysis of a Chiari I database was performed. Patients known to have an associated syringomyelia were then further analyzed for the type of syrinx present. When an eccentric syrinx was noted, the symptoms and postoperative course of these patients were analyzed. 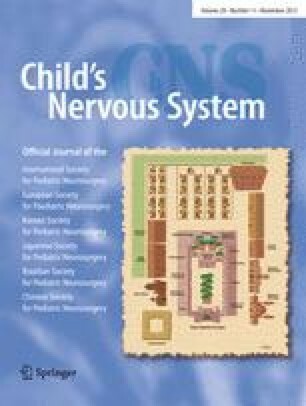 Of well over 500 operative cases of Chiari I malformation, roughly 70 % (pre-syrinx and minimally dilated central canals were excluded) were found to have an associated syringomyelia. Of these, four patients were found to have an eccentrically positioned syrinx. Three of these cases presented with symptoms referable to the side of the eccentric syrinx. Postoperatively, cases with both a central and eccentrically located syrinx were found to have a greater decrease in the size of the central portion of their syrinx compared to the eccentrically located portion. Symptoms decreased in all patients. The minority of our patients with hindbrain-induced syringomyelia were found to have an eccentrically located syrinx. Of these, most will have symptoms localized to the abnormal fluid-filled cavity, and these may not decrease in size as much as centrally located syringes following posterior fossa decompression. However, all symptoms decreased in those operated. Based on the literature, non-hindbrain-induced syringomyelia is more likely to result in an eccentrically placed syrinx. The mechanism for this is yet to be elucidated.